The Block Fort: "STOP COMPLAINING!" Episode 1 - Splatoon! 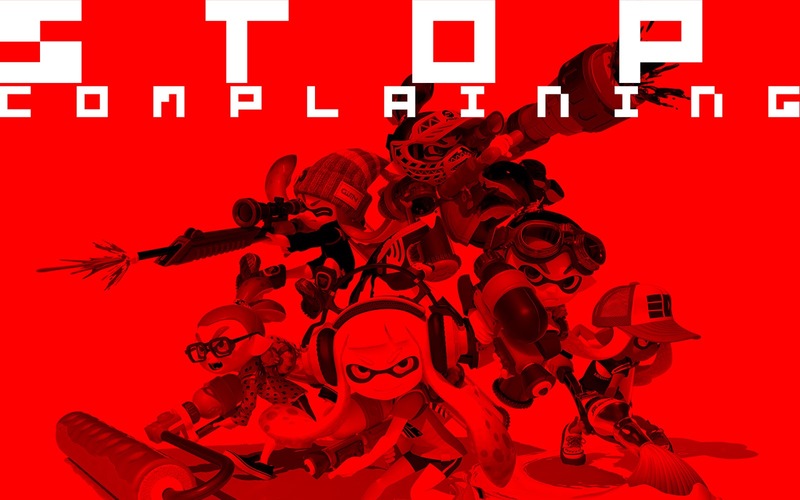 Welcome to "Stop Complaining!" A themed article where I take a topic people complain about try to bring some light to the subject. Today's rant is all about Splatoon! People seem to love hating on this game. Yet everyone agrees that it's addictive and fun to play. So why all the hate? Let's dive in. In Splatoon, you have basically zero control over what map you're going to play on. As of this writing, there are 8 total maps available, 2 of which are playable per game mode, and they rotate every 4 hours. So yeah, it's random. Mario Kart 8 allows players to vote on which track will be played, and then the dice is rolled to see which of those tracks is picked... Which is also random, with the illusion of control. Actually, Mario Kart's method of track selection is MORE random than Splatoon's! At lease you know you're going to play one of two maps and you can prepare accordingly. In my opinion , Splatoon is better off without voice chat. There, I said it. "Just give me the option to turn it off." Here's the problem with that. If team A has voice chat and team B doesn't, team A is going to win every time. It messes with the balance of the game as a whole. Personally, I end up yelling a lot at my TV when I play. That would be highly unpleasant for my team. Lack of content/Playing with friends. "This August, a "huge matchmaking update" is expected. This will add a slew of new matchmaking features, including friend-based matchmaking. This will allow either 4 Wii U friends to team up against another group of 4 Wii U friends, or allow 8 Wii U friends to secure a lobby for themselves, where the group will be able to decide the stage and ruleset." Spending $60 on this game if all you want to play is the campaign mode, I feel sorry for you. This is an online shooter after all. The fact that there even is a single player campaign is a miracle, and the fact that its really really fun is another miracle. So enjoy it, and maybe give the online mode a try. No weapon in Splatoon is overpowered. They all have weaknesses. You just need to learn to exploit it. Even though it seems like Ranked Mode is full of Aerosprays and Splattershot Jrs, I guarantee that those weapons are cheap, and easily exploitable. Keep trying. I personally favor the Gal series, with their superior range, spread, and damage. But everyone has their own style of play. A really good sniper or roller are invaluable to a team dynamic. Here's the bottom line. you may not be the target demographic for this game. It's made to be balanced no matter your skill level, age, or weapon choice. If you're unsatisfied with something about Splatoon, there are a thousand other online shooters you could be playing that have all the features you're looking for, and more! I know you'd stop playing if you could, but you can't because this game is amazing. so enjoy it! and try to cut back on complaining so much. Did I miss something? Do you disagree with me? Let me know in the comments! Let's chat about it! Maybe we can settle it over some Turf War!